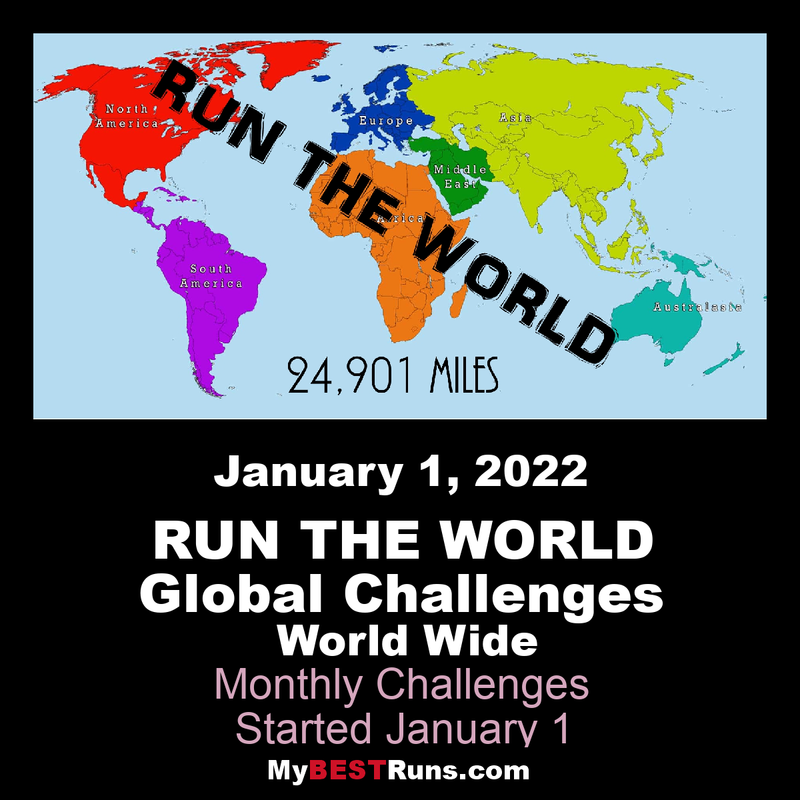 Run The World Global Challenge is a world wide celebration of running. Participants run or walk and then log in those miles (k’s) on their My Best Runs Account. There have already been five different challenges. Three (RTW1, RTW2 and RTW3) were challenges where each team logged enough miles to circle the world which is 24,901 miles. The best time was turned in by the RTW1 Challenge team finishing the task in 36 days, 23 hours and 13 minutes. RTW4 was a team challenge and the goal was to log as many miles as possible in 30 days. Michael Wardian (US) logged the most miles (744.75 miles). The 14-team member Team Kenya logged the most team miles with 3342.10 miles. A total of 83 participants logged 12,274 unique miles in the 30 days. RTW Challenge 100,000 Miles was a timed event to see how long it would take to reach the goal. The team started July 4, 2018 and finished on March 29 at 12:45 am. Willie Korir from Kenya logged the most miles (3,953.66). The top female was Kat Powell who logged 985.08 miles. A little more than half the total miles were run in the United States (51,145). 19,720 miles were run in Kenya and 6,994 miles in India. Miles were run in 65 countries. A total of 278 people logged miles. Bob has helped inspire a lot of people and he looks forward to inspiring many more. He started Runner's World magazine in 1966 and published it for 18 years. He had 2.5 million monthly readers by 1985. 1. You need to set up a free My Best Runs account. You need to enter your real name, email, birthday, location, short bio and what you feel will be your average weekly mileage. This is where you log in your miles (k's) and post your comment and photo. 2. You will be able to log into your account with your email (user name) and password. When you sign up this happens automatically. 3. The Run The World feed has been established so everyone can follow our progress. When you post a photo from your run and a comment, it will appear in the feed. One mission is to motivate the team and inspire other people and this is one way we do it. 4. You can log in miles multiple times during the day or combine your mileage and do one entry. There are two types of runs, training or racing. Only enter the length of the race under that type. And if ran other miles that day enter those separately. 5. Be sure sure to put down the country were you either did the training run or race. We will track miles by country based on where you ran. 6. Only log in “real mileage” that can be running, racing, run/walk, walk/run or walking. It takes less than a minute to log in your miles and we hope you will make this commitment to be part of this event. 7. You have taken on the RTW Challenge with the understanding you will hold My Best Runs, Bob Anderson and Ujena harmless for anything that might happen to you during the course of this event. You give us permission to use your name, supplied information and photos to help promote this event. We will not give your email or any personal data to a third party. I ran the July 4th Challenge and enjoyed running in tandem with this awesome group of 175 people spread across the globe.. Looking forward to running the next challenge from 29th August. I am so excited to do this challenge. I have been running since 1962 and I love setting goals and achieving them. This is a team effort and we can only reach our goal of circling the world by all of us working together. Thanks for being part of our team. Outstanding achievement: This was a tie. Michael Wardian (44 US) logged 744.75 miles and Frank Bozanich (74 US) logged 500.13 miles. Most Inspiring: James Kalani (53 US) logged 400.88 miles. He set his sights high and he did it. He posted photos and comments everyday. Most Motivating: Brent Weigner (69 US) logged 293.68 miles in eight different countries. He posted photos and comments everyday. Best Performance: Tie Michael Wardian (44 US) logged ran and logged 631 of his 744.75 miles in ten days as he set the FKT (Fashion Known Time) on the Natonal Israel Trail.And Eliud Esinyen (35 KE) ran three times most days logging a total of 656.12miles. Best Oldest performance: Frank Bozanich (74US) logged 500.13 miles.Paul Shimon (72 M) logged 360.56 miles.Linda Robinson (69 US) logged 108 miles. Top Fifteen Spirit awards: (Based on posts on the Feed) James Kalani, Lisa Wall, Brent Weigner, Eliud Lokaol Esinyen, Paul Shimon, Kat Powell, Michael Anderson, Dana Anstey, Bob Anderson, Fourie Family, Lize Dumon,Aaron L Salvador, Willie Korir, Kiranpal Singh Dhody, Geoffrey Smith. Best Single Run: Michael Wardian (44 US) 631-mile 10 Day run in Israel. Team Standings: The winning 14-person team was Red Team 9 - TEAM KENYA logging 3342.10 miles. Close behind was Red Team 6 - TEAM USA logging 3257.42 miles. Third was Green Team 15 - HALF MARATHONERS and BEYOND with 3205.29 miles. Placing sixth in the team competition was the Blue Team 1 - AGE 70 PLUS with 2470.63 miles. Not bad for a group of 14 70-plus runners. Click here for the final team standings. Notable Mentions: 1.Wille Korir (27 KE) logged the third most miles (547.60) even dealing with some leg issues. 2. Joel Mwangi (33 KE) ranseveral quality races in Italy including a 1:04:10 half marathon and a 30:14 10k. 3. Bob Davidson (71 US) had his knee replaced and still was able to log 143.02 miles. 4. Kat Powell (68 US) logged 84.62 miles for this Challenge but was also the top female in our RTW Challenge 100,000 miles having logged nearly 1000 miles. 5. Gene Dykes (70 US) ran a 1:27:10 half marathon on March 24 just as a prep for Boston. 6. Bill Dunn (71 US) finally got the green light to run after a one year layoff due to a serious injury and logged 55.40 miles in the spirit of things. Run The World4 had three groups of five teams each (maximum of 14 per team). One person can be part of one, two or on three different teams as long as they are part of a different group (Blue, Red and Green). The event ended 30 days after the start date of March 1. Here are the details for the 15 teams. Red Team 10 – WESTERN USA TEAM (Runners living in Montana, Wyoming, Colorado, New Mexico, Idaho, Utah, Arizona, Nevada, Washington, Oregon, California, Alaska and Hawaii. Most Inspiring: Lize Dumon set her goal to reach 200 miles and she did that. She also motivated other team members in South Africa that she recruited to reach their goal as well. Most Motivating: Aaron L. Salvador from the little country of Palau logged 377.99 miles and posted a note and photo everyday. Best Performance: Elius Lokol Esinyen from Kenya run and logged in 1298.59 miles. That is an average of 18.9 miles per day. Many days he ran three times per day. Shared with 70-year-old Gene Dykeswho became the second person in his age group to run a marathon under 3 hours when he clocked 2:54. Best Youngest performance: Zander Brister age 11 who logged in 66.6 miles and with increased mileage is setting PR's for all distances. Best Oldest performance: Frank Bozanich age 74 logged1036.19 miles. Shared with 72-year-old Paul Shimon who logged 803.06 miles and first America woman was 71-year-old Karen Galati who logged in 223.88 miles. Best Single Run: Michael Wardian placed 8th overall and ran some of the best times including clocking 2:34:54 at the New York City Marathon. He also ran a tough 50-miler in Israel. He posted 651 miles for his third trip around the world with us. Notable Mentions: 1. Ultra super star 48-year-old Gloria Nasrran and logged 422.54 miles to place first female. Gloria lives in Paris, France. Some of her miles were also ran in Peru when she travelled there to run an Ultra. 2. Brent Weigner travelled to additional countriesrunning more marathons. No one has run more marathons and beyond in more countries. 3.Lize Dumon ran her first marathon and loved it. 4. Aaron Salvador managed the largest team and keep the spirit going the whole 68 days. 5. Willie Korir has to deal with a leg issue but still run and logged in 858 miles. 6. 61-year-old Michael T Anderson not only logged in 545 miles but ran some fastraces as well and alsoqualified for the Boston Marathon. 7. 62-year-old Kiranpal Singh Dhody from India logged in 363 miles the best from India. He ran several racesand is training for some major races coming up. Outstanding achievement: Frank Bozanich age 74 logged 801 miles. Best Performance: Willie Korir from Kenya logged the most miles (993.88) which is an average of 22.5 miles per day. This is being shared with Joel Maina Mwangi also from Kenya who not only logged in 610.44 miles but he raced four half marathons during the Challenge clocking 1:02:52, 1:03:19, 1:02:50 and 1:02:54. 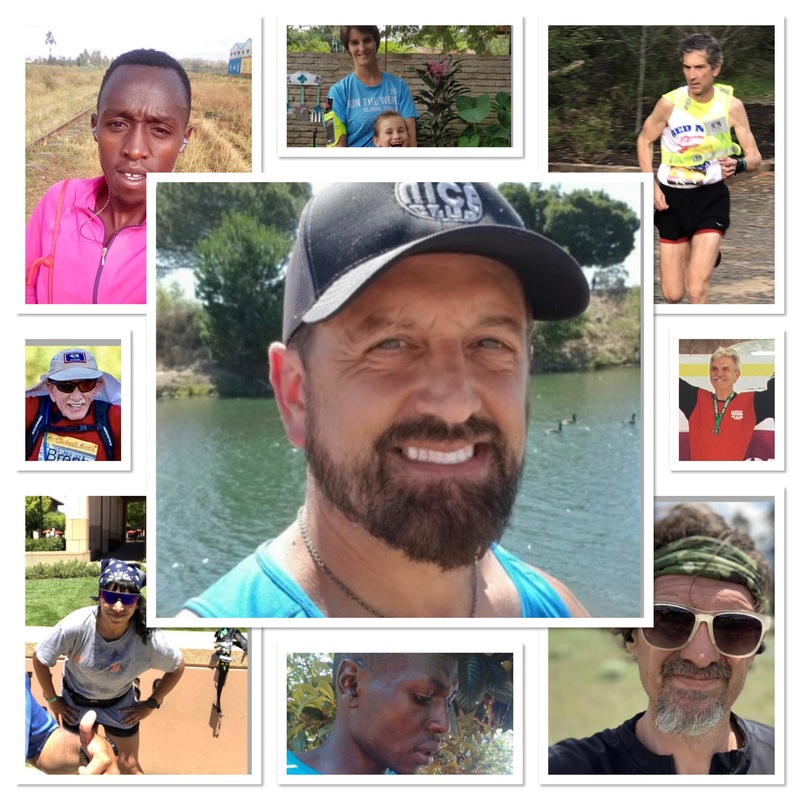 Five Most Inspiring stories: based on their story posted on My Best Runs: (this award goes to the five who received the most views on My Best Runs) Joyce Lee (1178 views), Michael Wardian (851 views), Gloria Nasr (616 views), Joel Maina Mqangi (492 views), Pete Magill (400 views). Best Youngest performance: Zander Brister age 11 logged 16.32 miles. He ran one mile in Hollister clocking 6:19 and He also averged 7:42/mile pace at the Pacific Grove Double Road Race 15k. Best Oldest performance: Frank Bozanich age 74 logged 801 miles. Shared with 71-year-old Paul Shimon who logged 655.37 miles. Notable Mentions: Boaz Kipyego logged 788.61 miles and came to the United States and placed fourth at the Twin City Marathon. Rosaline Nyawira was first female logging 454.37 miles. 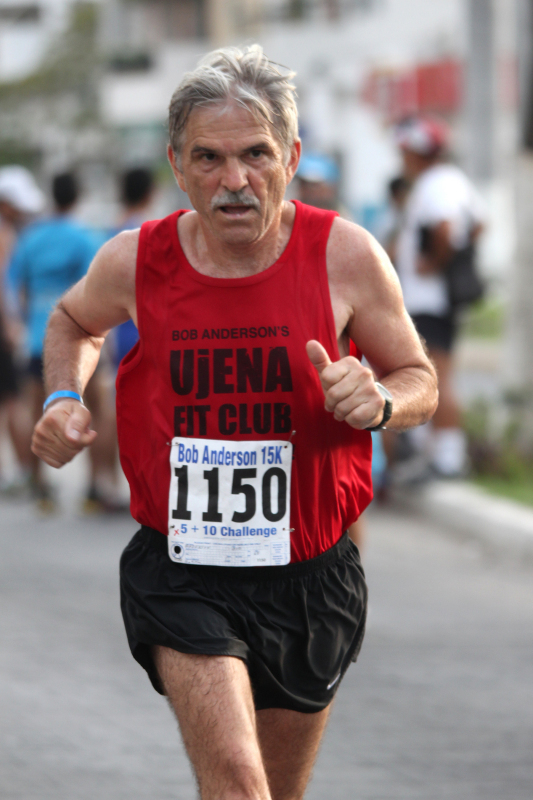 Brent Weigner (69) has been running races every weekend including running a marathon in another country Sri Lanka. He logged 258 miles. James Kalani has gotten back into running (this challenge motivating him) and has already run 4 miles at 5:33 pace. He logged 252 miles. Ultra marathon star Gloria Nasr from France logged 237 miles. Rosaura Tennant ran both the Berlin and Chicago marathon during this Challenge. Becca Pizziwas first womanin the marathon run insidea NFL stadium in Boston. Outstanding achievement: Frank Bozanich age 74 logged 475 miles. Most Motivating: Grace Padilla (US) logged 327.11 miles, posted a comment and creative photo everyday. Grace, who is 47, placed 11th overall and was first female. Best Performance: Willie Korir from Kenya not only logged the most miles (797.37), he also ran one of his workouts at 4:37/mile pace for 9.13 miles. Best Youngest performance: Owen Wall age 11 who logged 34.2 miles including running 8.1 miles in one day at 9:59 pace his longest ever run. Shared with Elliot Daniels age 14 who ran and logged 184.45 miles and ran 5:47/mile pace for six miles in the Wharf to Wharf race in Santa Cruz, California. Best Oldest performance: Libby James age 82 who logged 81.81 miles (rounds up to 82). Shared with 74-year-old Frank Bozanich who ran and logged in 475 miles. Top Fifteen Spirit awards: Aaron L Salvador, Grace Padilla, Shawn Whalen, Michael Anderson, Brent Weigner, Danilo Purlia, Larry Allen, Rosaura Tennant, Asya Cabral, Kati Toivanen, Lize Dumon, Roger Wright, Abbey Cannon, Geoffrey Smith, Pulkit Singh. Best Single Run: Michael Wardian when we ran 100.5 miles in 30 hours 23 minutes and place 11th on July 21 at Hardrock 100.
Notable Mentions: Dave Mcgillivray logged 164.52 miles (Boston Marathon Director), Becca Pizzi logged 226.17 milesv(Holds the record for running seven Marathons. Seven days on seven continents), Liz Dumon from South Africa had never run 150 Miles in 30 days before this challenge,Boaz Kipqego from Kenya logged 588.52 miles and placed second, JR Mintz (age 52) logged the most miles by an American with 480.86 miles, Paul Shimon (age 71) logged 390.71 miles placed 6th overall and third American, Harpal Singh Gill was first runner from India logging 331.66 miles placing 10th overall, Sam Tada was first runner from Japan logging 237.30 miles placing 29th overall, Malin Andersson co-owner of World´s Marathons logged in 77.67 miles and Will Adams who logged 51.58 miles mostly all plogging (picking up trash while running).